Correctly installing your hammock or swing ensures its functionality and will maximize your enjoyment of your product. Your Nudo product is most secure when installed on sturdy hanging sources such as studs, beams, posts, or trees. 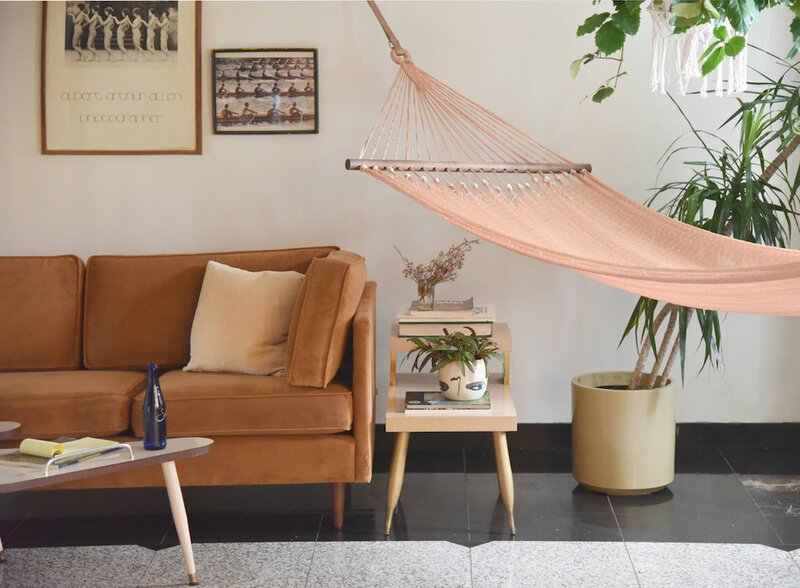 Both hammocks and swings will stretch slightly with use due to the nature of the handwoven materials; please consider this evolution as you decide where to hang your new piece of furniture. We sell easy to use sets of Hammock Mounts and Swing Mounts. For a hammock, we recommend your two hanging points be between 13 and 16 feet apart. For the Alba Swing, we suggest the Eye Loop above the rod hang at least 6 feet from the ground, or 5.5 feet for a SOLO SWING. A wood or steel stand can also be an effective method of hanging your hammock or swing, contingent on the distance your product rests from the hanging point(s). If you do not feel confident or have the required tools to hang your hammock or swing yourself, we strongly suggest you find an able handy-person in your area to safely install your hammock. We love Task Rabbit!